Christmas is a time for seeing family, eating turkey, and ganking kids in Dota 2. That’s what we can take from Steam’s concurrent user stats; a record number of you logged into Steam over Christmas: at one point there was more than 8.5 million people logged into Steam at once. 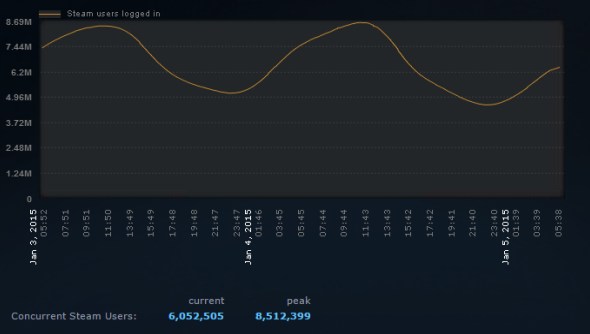 Steam broke through 8.5 million concurrent users on January 2, almost six months to the day since it hit 8 million. In fact, year on year, Steam’s concurrent user numbers have increased at a rate of 500,000 users every six months for the past four years. You’re counted as a concurrent user simply by being logged in to Steam. So if you’ve Steam running in the background as you read this article then you’re adding one to that pool of millions. Steam’s evergreen growth is a healthy sign for Valve and a good sign for the number of people playing PC games. I want to know how those numbers will grow when Valve finally get around to launching their Steam Machines. Will the rate of growth increase or will they be cannibalising their own audience?